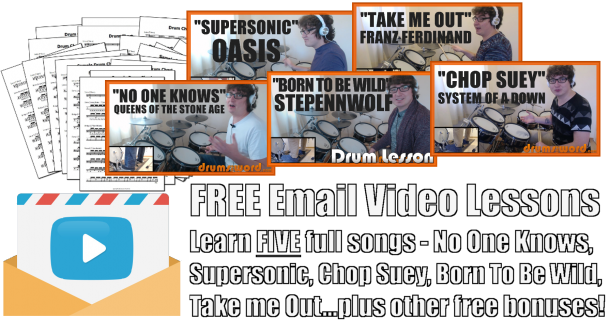 I thought I’d share with you some of the drum licks I’ve been working on and that have been inspiring me to play recently in the hope that they might give you a some inspiration and ideas whilst out in your practice shed. All of my drum licks usually involve a simple pattern or motif that I then work on developing further. A basic pattern allows you to memorise it quickly, learn the muscle memory for it and then speed it up to whatever you tempo you desire. When you’re playing at speed you don’t want to be thinking about complicated hand stickings, you just want it to flow out of you naturally. The ideas in this mini lesson involve the double bass drum (something I’ve neglected in my practice before recently), mixed with double stroke and single stroke combinations with the hands. The use of accents and tom toms takes these drum patterns even further. The pattern labelled number one shows how to start off practicing this lick on just the snare drum. This is to ensure that all of the notes are played smoothly and evenly. All eight of the thirty second notes take up a whole beat of the bar. The hands are playing the Paradiddle-diddle with the first two singles accented loudly. The last two bass drum notes are supposed to be played on double bas drum for extra power and speed but could be played on a single pedal if you’re technique is up to scratch. Whenever I play this pattern I’m thinking of it in terms of a double stroke roll with the occasional flurry of two bass drum notes followed straight after by two single stroke accents. You can see this if you imagine starting this lick with the double strokes (RRLL) and then, when desired, throwing in the Quad style BassBassRightLeft. This fill idea doesn’t just have to be used as an eighth note motif but could be used instead within a snare drum roll with the BassBassRightLeft part being thrown into the roll for affect. The next three ideas (numbered above each) involve orchestration suggestions. Number two moves the first accent onto the floor tom. This sounds really cool in my opinion! Number three moves both single stroke accents to the high tom but any tom could be used instead (this is similar to an idea further on below). Number four uses both the floor tom and the high tom. Alternatively, for all four of these ideas you could try reversing the double bass Quad part into RightLeftBassBass to give a different feel to the idea. This linear drum fill idea involves playing two different subdivisions; sixteenth notes and thirty second notes. The two accents (RL) are played as sixteenth notes and the double bass drum Quad part (RightLeftBassBass) is played at double the rate through thirty second notes. Again, just like the previous drum lick, I like to play this idea in the context of a single stroke roll on the snare drum with the Quad part being thrown in when desired. This adds an exciting and a powerful lick to the single stroke roll and can be applied in many musical situations. I tend to always accent after the Quad flurry as this feels more comfortable. Linear lick idea number one moves the two thirty second note accents onto the high tom. This is my favourite as the hands can move between the snare drum and high tom naturally and quite comfortably. Idea number 2 shows the two thirty second note accents on the floor tom. Drum lick number three and four involve the opposite idea to ideas one and two. The Quad flurry is reversed so that the it now starts with the bass drum. This has a really cool sound to it as the single stroke roll (mentioned earlier) is suddenly broken up and interrupted by two powerful bass drum strokes followed immediately by two tom toms. You can choose to accent the tom tom parts as well if desired. Be careful when looping this variation as you will see that the hands move from thirty second note single strokes straight back to sixteenth notes without the use of the bass drum to break the hands up. The final linear gospel drum fill idea I’ve been working on late into the night involves my old favourite, the six stroke roll. This is a variation of the paradiddle-diddle. It still includes two single stroke accents and two double strokes but in a different order. You could think of the six stroke roll as a hybrid rudiment in a way. The lick starts with a five stroke sticking (RLLRR) followed by the two double bass drum notes and ended with the final left hand. It’s only when you loop this lick that you feel the six stroke roll in action. The final left hand comes round to join the beginning of the five stroke completing the six stroke roll. This really is a very tasty linear lick. The right hand accent comes down nice and powerfully at the beginning of the lick having been proceeded by two bass drum notes and a single accent with the left hand. I tend to use this pattern as written, as an eight note motif that can be thrown into any fill when desired. Variation two involves moving the right hand to the floor tom while variation three has the left hand move to the high tom. Any tom toms could be used for this. Finally, variation 4 uses both the high and low toms. Combined with the bass drums this gives a really cool bassy sound and lots of bottom end punch!